Whenever Urban Sketchers (USk Chicago) look for a warm, friendly place to huddle during the cold winter months, we look for each other. USk Chicago members braved the cold and came together at The Den Theater in Wicker Park. Thanks to Joel Berman for making this connection for us. With so many productions in the works or currently showing, there were lots of areas where sketchers could lose themselves. The sketchbooks below demonstrate that there were no shortage of sketching subject matter. There are some people missing from the group photo, but it was hard to find everyone in the dark nooks and crannies of this amazing space. Photo credits ©2016 Jim Christensen (Muriel's husband) — with Alex Zonis, Peggy Condon, Muriel Ann, Jodie McGovern, Jane Ostergaard, Mary Harney, Joel Berman, Susan Rooney, Wes Douglas, Mark Jones, Don Yang, William E Fagan, Paul Ingold, Fred Polito, Junad Rizki, Sandra Beaty, Lisa Ridolfi, Ben Collins-Sussman, Captain Joel Siegel, Paul Minnihan and plenty of others who were tucked in and around the nooks & crannies of this creative space. 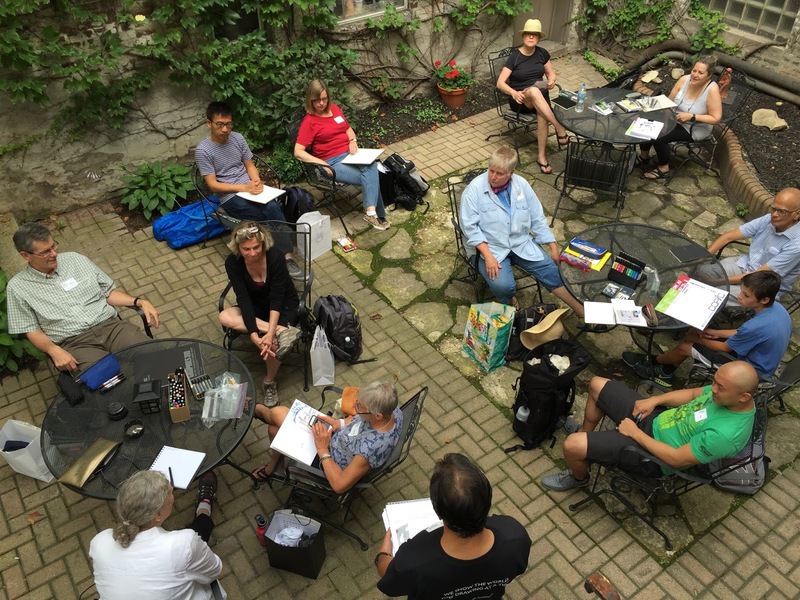 USk Chicago Sketch Seminar - July 9-10, 2016!! Urban Sketchers Chicago are excited to announce that once again we will be giving our USk Chicago Sketch Seminar 2016!! It will be our third! Seminar 2016 will take place on July 9-10, 2016. Please mark your calendars! And we hope to see you, from close and from afar, sketching with us in Chicago this summer! Sketchers, watch this space! More news soon!